NuGrid Power Corp. is a specialized consulting and testing firm focused in the areas of high voltage instrumentation and substation automation. The NuGrid team, along with a network of expert associates, can assist with projects in synchrophasor deployment, live-line instrumentation calibration, digital substation and process bus implementation, metrology, and any complex deployment of new power technologies. 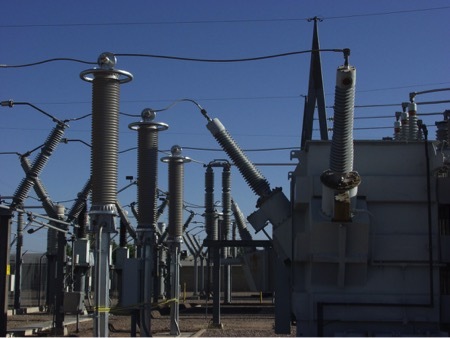 NuGrid also has a selection of advanced optical sensors and specialized techniques for traceable calibration work in substations to 550kV. Farnoosh is a Professional Engineer and a leading expert in electrical power system instrumentation, measurement, and testing. During his 23 years in the electrical power industry, he has developed methods and tools to improve power system measurements, monitoring, metering, and protection and has been awarded 11 US patents. Dr. Rahmatian is very active with IEEE, IEC, CSA, and CIGRE. He is a Fellow of the IEEE, and vice chair of IEEE PES Technical Council. He is an active member of IEC TC57 WG10 (developing IEC 61850, digital substation communications protocol) and IEC TC38 WG37 (developing IEC 61869-9/13 substation process bus and merging unit details), vice-chair of CSA/Canadian National Committee of IEC TC38 (Instrument Transformers), a member of IEEE-PES-PSRC (Power Systems Relaying Committee), the chair of three IEEE-PES and CIGRE working groups on digital/optical instrument transformers and synchrophasor field testing, calibration, and deployment. Dr. Rahmatian has published over 70 papers in technical journals and conference proceedings mostly in the areas of power system instrumentation, measurements, monitoring, protection and control. Patrick is a consultant and Professional Engineer in NuGrid’s measurement, calibration, and substation practice areas. His work has been multi-disciplined technology development and technical leadership at the device and systems levels. Prior to joining Nugrid, he was an engineering and business unit manager of Powertech Lab’s electrical labs and Substation Services department, providing specialized testing services and studies to power equipment manufacturers and utilities from around the world. His work has directly resulted in the invention and full development of a new generation of non-conventional optical voltage transformers for 115 kV to 550 kV metering and protection applications while employed with NxtPhase T&D, development of cryogenic magnetic shielding for special superconducting quantum interference device operation while employed with quantum computing startup D-Wave Systems, and development from concept to product of a machine-learning quantitative stock portfolio management system for publicly traded securities as founder of Innovol Corporation. Dr. Chavez holds several peer-reviewed journal and conference publications, patents, and awards in relation to his work on NxtPhase’s novel high-voltage optical voltage sensing technology, the NXVT. Steve is an author and business leader with 25 years of experience bringing new technologies to market in the power and telecommunications sectors globally. His work has spanned a broad spectrum including brand formation and company development, international business, product management, market development, R&D, and business strategy across a range of technologies including dc measurement, optical sensing, protective relaying, a variety of smart grid sensors, satellite signal processing, broadband fiber optics, and optical mass data storage. He has served as a medium voltage sensor device expert on a major smart grid utility project. Dr. David Peelo is a consultant and former switching specialist at BC Hydro. He is a graduate of University College Dublin (BE Electrical Engineering) and Eindhoven University of Technology (PhD). He worked first at the ASEA Power Transmission Products Division in Ludvika, Sweden and then for BC Hydro for 28 years rising to the position of Specialist Engineer. As a consultant, he has clients worldwide and in particular teaches continuing professional development courses on current interruption transients and surge arrester application. He is an active Cigre member and is a past Convenor of IEC MT32 (Inductive load switching), the Convener of IEC PT42 (Current interrupting capability of air‑break disconnectors) and a member of IEC MT57 (Application guide for IEC 62271‑100 and other circuit breaker related standards). He is an IEC 1906 Award recipient and a Distinguished Member of Cigre. He has authored or co-authored over 70 publications on circuit breakers and surge arrester application, is the author of a textbook on current interruption transients calculation and a co-author of a textbook on switching in transmission and distribution networks.